Free cancellation/ reduction in numbers till 10 days before arrival. Deposit is non refundable. Full payment should be done 10 days before arrival to our bank account or via PAYPAL. At Stray Cat Hostel we endeavour you to have authentic, creative and engaging travel experiences. Here we, the staff, are travelers' connection to the city. We are here to present you different ways to enjoy . Stray Cat Hostel is a social hostel, but not a party one. There is some writing on the entrance wall which explains our preference about tolerance: We are not able to tolerate any kind of behaviour consisting of religious, sexual, or ethnic discrimination. This is for the comfort of any individual staying with us. Enjoy being here. 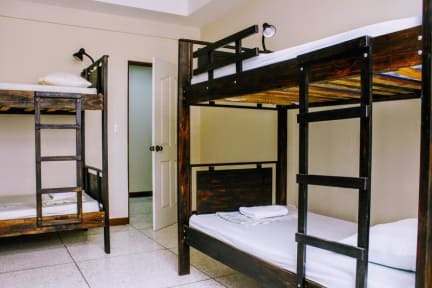 We are conveniently located in San Jose, Costa Rica between the bus stations, the largest park in the city, and the downtown cultural attractions. Stray Cat is just outside the noisy hustle and bustle but still close enough to be only a 10 minute walk to the central avenue. Travelers love that within 5 minutes you can walk to most of the long-haul bus stops which can take you across all of Costa Rica. From our facilities you can visit and explore some of the finest attractions of San Jose such as National Museum of Costa Rica, Museo Calderón Guardia, National Theater of Costa Rica and Antigua Aduana, amongst other interesting attractions of our city. 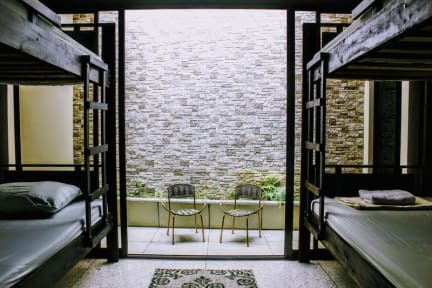 We have several types of accommodation options, both private options and dorms, to suit the needs and wishes of all our guests and travellers. In addition, we have several common areas where the guests can exchange experiences and future plans. We have several amenities such as free city maps, free safety boxes, etc. Very good hostel and great breakfast! I would love to come back! Perfecta ubicación si tienes que pasar la noche para el bus del día siguiente. Limpio. Habitaciones amplias. Personal amable. La muchacha que nos atendió fue excelente, su amabilidad y ganas de que estuviéramos comodos, el desayuno estuvo muy bien y los precios fueron muy accecibles lo recomiendo 100% . The most helpful and friendly staff I've ever met. Great location next to the bus stops and lovely place. Highly recommend! The staff is unbelievably friendly and helpful at this conveniently located hostel, which was way better than I expected. It is 10 minutes walking distance from 7/10 bus station and 15 minutes from the center of the city. The dorms are big enough, the bathrooms clean with some amenities, there are lockers and a small kitchen. Highly recommended. I popped in after a really late bus and the gentleman from Turkey was so helpful! They were booked but he helped me get another location and an uBer. I came back the second day as this hostel is located right next to the Mepe bus terminal and Tika terminals so it is helful. Beds clean and good, bathroom was spotless as well. The only thing I could say is the 2:30 check-in time stinks, as it was completely ghost town and the a.m. shift said we had to wait for the p.m. shift to check in at 2:30. Wonderful location if you want to be close to bus terminals. It is very convenient for traveling in Costa Rica. Very helpful and knowledgeable hosts. Free breakfast was a bonus Would definitely recommend. A great hostel with some of the most helpful staff! Maps offered, clothes can be washed and dried for a small price, restaurant recommendations, bus and travel information freely available and the kitchen seemed well equipped. The beds and mattresses need an update but are still reasonably comfortable. The showers get a bit grimy throughout the day but I think that’s more down to the guests. Stray Cat Hostel was clean and comfortable, with helpful staff. Stayed there one night on arrival to Costa Rica. In the morning I booked a stay for my last night. Would stay again. Neighborhood is a bit uncomfortable for walking alone, but the location is close to bus terminals, etc. so ubering is inexpensive. Cereal and toast for breakfast. This is a 1 night stay hostel for peeps headed out in the morning to terminal 710. It's hella close. Any hostel close to downtown San Jose will be noisy. they tried to give me an 8 bed when I payed for a 6. Besides that, it did the job just fine. My mom and I stayed here for 11 nights (aside from 2 in Monteverde). The staff was absolutely amazing and it was always nice coming back to a friendly hello. The hostel was within walking distance of downtown San Jose (about 15-20 min) which was very convenient, and staff made great recommendations for food and things to do to fill in time. My only real complaint would be the showers. You really had to time them well. Sometimes water was cold, other times shower just shut off randomly.